LONDON - Global stock markets mostly fell Monday after disappointing manufacturing surveys in China and Europe reinforced concerns over the economic outlook. The Japanese yen continued its slide following last Friday's surprise Bank of Japan stimulus, falling to a seven-year low against the dollar. 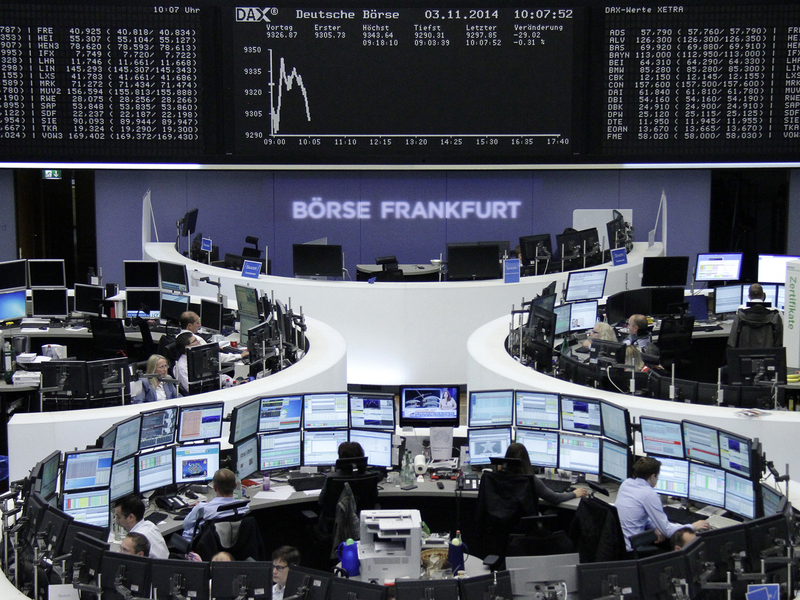 In Europe, Germany's DAX declined 0.5 percent to 9,277 while France's CAC-40 fell 0.5 percent to 4,214. Britain's FTSE 100 was 0.4 percent lower at 6,521. Wall Street was poised for modest falls at the open, with both Dow futures and the broader S&P 500 futures down 0.2 percent. The first trading day of a month sees a flurry of manufacturing surveys around the world, culminating with the Institute for Supply Management's report for the U.S. Ahead of that, a gauge of Chinese manufacturing released by a government-sanctioned industry group declined 0.3 points to 50.8 on a 100-point scale on which numbers above 50 show an expansion. The consensus in the markets was a reading of 51.2 points. The unexpected weakness fed concern that growth in the world's second-largest economy will decline further. A similar report into the manufacturing sector of the 18-nation eurozone from financial data firm Markit was similarly downbeat. Although the October eurozone index rose to 50.6 from the previous month's 50.3, it's not far off contraction territory. "A raft of disappointing PMI readings from the eurozone and Asia weigh on investor sentiment," said Craig Erlam, market analyst at Alpari. The manufacturing reports kick off what's likely to be a busy week in the financial markets, with the European Central Bank meeting on Thursday to decide whether it will sanction further measures to stimulate the ailing eurozone economy. Friday sees the U.S. nonfarm payrolls report for October -- figures that often set the market tone for a week or two after their release. Now that the Federal Reserve has completed its latest stimulus, investors are assessing when the Fed will start to raise interest rates. China's benchmark Shanghai Composite Index gained 0.4 percent to 2,430.03 while Hong Kong's Hang Seng declined 0.3 percent to 23,915.57. Tokyo was closed for a holiday but the dollar was trading at a seven-year high against the yen after the Bank of Japan's announcement Friday. Seoul shed 0.6 percent to 1,952.97. Taiwan and Singapore rose while India and Sydney declined. The flat tone in the markets Monday contrasts with last Friday, when Japan's central bank surprised markets with its announcement that it will step up bond purchases in hopes of stimulating spending in the world's third-largest economy. The Bank of Japan said it will increase its purchases by 10 trillion yen to 20 trillion yen ($91 billion to $181 billion) to about 80 trillion yen ($725 billion) a year. That boosted sentiment in stock markets after the Fed's decision to bring its stimulus to an end. However, it weighed heavily on the Japanese yen, which continued its precipitous fall Monday. The dollar was 1.2 percent higher at 113.62 yen. That's the first time it has breached the 113 yen level since December 2007. Benchmark U.S. crude was up 19 cents at $80.73 a barrel in electronic trading on the New York Mercantile Exchange. Brent crude, used to price international oils, was 12 cents higher at $85.98 per barrel.